You are currently browsing the Osteoarthritis Blog blog archives for October, 2012. The patella should rest between the femoral condyles (as pictured on the left). In patellar tracking disorder, the quadriceps pulls the patella outside of the groove. Patellofemoral pain is the leading cause of knee pain among athletes. It is diagnosed by non-specific pain between the patella (knee-cap) and femur (thigh bone). Patellofemoral pain is often referred to as “runner’s pain” because it can be caused by activities involving frequent contractions of the quadriceps muscles. This does not mean that only runners can develop patellofemoral pain. It can also be caused by osteoarthritis of the knee and by patellar tracking disorder. Patellar tracking disorder occurs when the overall pull of the quadriceps is too lateral. This draws the patella outside of the vertical groove between the femoral condyles (the two side-by-side balls at the end of the thigh-bone) when the knee bends and straightens. This sideways slide leads to knee pain and worsens osteoarthritis by wearing down the cartilage behind the patella. Patellar tracking disorder is frequently treated with knee braces designed to maintain the patella’s natural alignment. It can also be treated with kinesiotape (the colorful tapes that olympians wore this past summer in London). These treatments tend to be both simple and effective, so if you suffer from patellofemoral pain, consult your doctor to see if they might help you. A recent article in a European journal confirms that type II diabetes is an independent risk factor for severe osteoarthritis. We already know obesity can make osteoarthritis worse, and that obesity can lead to type II diabetes. But we are only learning now that the metabolic effects of type II diabetes may lead directly to ostoearthritis. More importantly, Dr. Schett, the author of the paper, claims that type II diabetes makes it harder to treat osteoarthritis. Dr. Schett found that osteoarthritis patients with type II diabetes had dramatically reduced the benefits from arthroplastic surgery. Diabetic patients with osteoarthritis of the knee had increased swelling in the joint space when compared to non-diabetic people of the same age and BMI. This suggests that the systemic effects of diabetes make osteoarthritis worse by increasing the stress on the cartilage. It would be like adding 50 pounds of extra pressure to a joint already supporting a body above its weight-class. This is not all bad news. In many ways, this simplifies the treatment of osteoarthritis in patients with type II diabetes. It means that instead of treating two conditions at the same time, treating the diabetes may help with the osteoarthritis directly. It also means that addressing unhealthy eating habits, a well-known cause of type II diabetes, could be the only treatment necessary. Weight-losing lifestyle changes may be the only way to a healthy body. Not just on the surface, but for your bones, joints, and cartilage as well. Knee pain is treated with many different braces, depending on the source of knee pain. Osteoarthritis of the knee is a common diagnosis, and can occur in several variations. One common type is called “unicompartmental osteoarthritis”. This means that the osteoarthritis primarily effects one side of the knee (usually the side closer to the other leg). If you have this type of knee osteoarthritis, then a medial knee brace for OA may be right for you. A medial unloading knee brace supports the weight the would pass through the injured compartment. 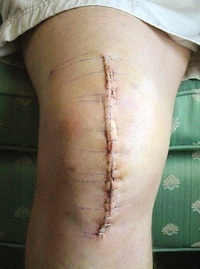 It also redirects some of the remaining forces through the other compartment of the knee. This reduces the stress on the osteoarthritis. The medial knee brace for osteoarthritis can help without restricting motion at the knee. In fact a recent study by the Steadman Philippon Research Institute found that a medial unloading knee brace can improve function and reduce the need for pain and anti-inflammatory medications. If you have persistent pain on one side of your knee, then the medial OA knee brace may be right for you. Braces make great solutions because they are mechanical, and not physiological solutions. This means that the side effects are minimal, and adjustments can be made as necessary without the risk of systemic problems.